The battle for the left field job just got a little clearer. 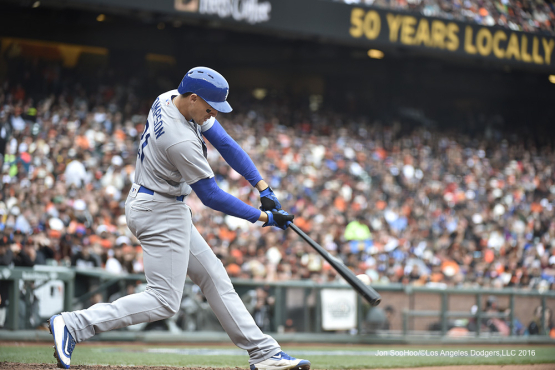 The Dodgers have announced that they have designated outfielder Trayce Thompson for assignment. His 40-man roster spot will be given to triple-A right hander Cory Mazzoni who was claimed off of waiver from the Chicago Cubs. The move definitely gives us some clarity on the opening day roster. For Thompson it’s a sad end to his brief Dodger career that was marred by injuries. Thompson had some promise, especially during his first stint with the club. He got off to a fast start but the back injury was just too much to overcome in time to be able to get enough playing time to establish himself above the rest of the outfielders. Thompson was having a decent but not great spring. In 48 plate appearances Thompson was slashing .255/.271/.362 with one home run and just two runs driven in. He played in 20 games and was pretty unspectacular all around. I would expect for somebody to pick him up, but he just didn’t have much of a place on this team. That was the thing about Thompson. He was a good but not great player and I still don’t know if he’ll be able to play every day with his history of injuries. I think his ceiling is as a fourth or fifth outfielder. He’s a useful player but he may never become a productive regular. Hopefully he proves me wrong because I wish him the best. But the Dodgers have plenty of guys that can serve in that role. With the club already announcing that they’ll be carrying a 13-man pitching staff that means a 4-man bench instead of the standard 5-man bench. Chase Utley and Enrique Hernandez are roster locks. It would seem that either Joc Pederson or Andrew Toles could be the backup outfielder. That also means that Matt Kemp probably gets the starting slot in left field despite his bat cooling off over the last couple of weeks. As for Mazzoni? He’s just a placeholder. He’ll report to Oklahoma City until his roster spot is needed. He’s 28-years old and has appeared in 14 MLB games with the San Diego Padres. He’s posted a career 17.28 ERA in the bigs with 12 strikeouts and 40 hits allowed in a little over 16 frames. In the minors he’s fared better posting a 3.79 ERA across 373 innings while recording a 27-15 win/loss record. Toles must have read your comments about spoiling good pitches, because after he was down with two strikes early in his count last night, he had a seven pitch at bat, before he hit that ball out. Kemp will either go down with injury (possibly he is struggling with the bat lately because he has been struggling with an unnamed injurty) or he plays himself out of the outfield. Joc vs. Toles: really can there even be a question who is playing better now or has played better in the past. I say it again, Toles was the starting LF last year and went down with injury, the spot has to be his, just look at his spring compared to Itch. It should be pretty clear. Well Joc is starting tonight, not Toles. Maybe Joc was the connection that got John Legend to perform at the Dodger’s Blue Star Gala, because Legend sang at Joc’s wedding? Well True you are going to eat your words on Kemp. He just hit a HR by the way. Kemp is healthy, and he has always hit. I cannot understand how all you Kemp haters dismiss the fact that since he left LA he has done nothing but hit except last year when he battled a bad hammy. First at bat Joc swings at ball 4 on a 3-0 pitch. Then swings at ball 4 on a 3-2 pitch. Continuing not good. If noticed a lot of poor pitch recognition from this lineup. He has looked like crap and Thompson leaving means Farmer is staying. I am happy for Farmer, but I am not happy that they told Toles this was a competition. Toles knows Joc is the one making this team, it is only obvious because Joc is being treated just like all the other regular Dodger players. He started tonight, and he came out of this game, before Toles came up to the plate. Indeed MJ, that competition was won by Toles a long time ago. Best thing for Joc would be the minors. He is simply not ready for mlb. I watched Bellinger carefully at the plate tonight. He seems to be swinging much too early and not making good contact with the ball. His timing looks off. Ryu is deceiving. He got the win but gave up 9 hits in 4.5 innings. Dodger bats will have to help these pitchers out all season. Let’s face it, we don’t have dominating pitchers. Life is not perfect, all the more so for the Dodgers. Listening to comments last night it seems that Toles is ok with going to OKC. He has regained his love for the game and he is pretty sure he will be back at some point. Playing everyday would be best for him anyway. I’d rather he play almost every day here. It’s better he sees Major League pitching. Kemp and Toles splitting at bats in left field is good for EVERYBODY. Toles could also play both center and right occasionally. I want him in LA. I like that guy. I like Verdugo too. Not high on Pederson. Does anyone think if Kemp was indeed traded, that Toles would be on the roster? I wonder if the platoon would be him and Verdugo? Two left handers in a platoon? Toles/Hernandez makes sense. 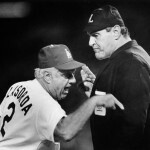 Maybe they decide to give the job full time to Verdugo and trade everybody else.